In a large pot snip the bacon into 1 inch pieces and saute over medium heat until it browns and starts to get crisp. Add in the shallots and sprouts and saute for a few minutes. De-glaze the pan with the Marsala wine, stirring up any brown bits from the bottom of the pan. 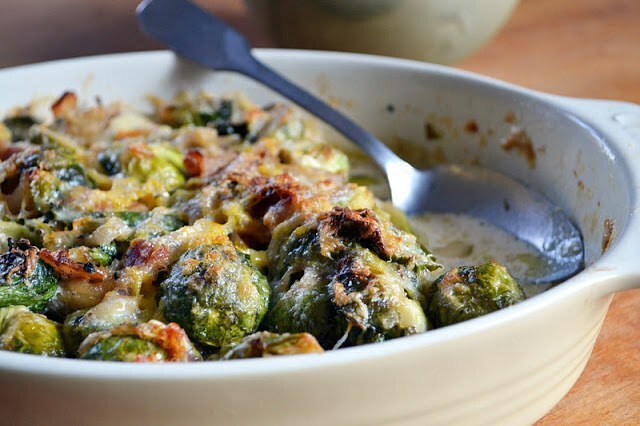 Put a little olive oil in the bottom of an oval gratin dish and spread out half of the sprouts in the dish. Season with salt and pepper, the thyme leaves, lemon zest, and a dash of nutmeg. Sprinkle half of the cheese evenly over the top. Dot with 1 Tbsp of the butter and season with salt and pepper. Top with the remaining sprouts, and the last cup of cheese. Dot with the last Tbsp of butter. Pour the cream gently over the whole dish. Bake for about 40 minutes until bubbling and browned.